This classic cookbook just took things to a fancier level! Any kitchen lover whether novice or pro will be surprised and fall in love with this leatherbound, hand-stamped version of “The Joy of Cooking” It’s available in six colors and can be personalized! This beautifully crafted piece is from a sturdy slab of reclaimed timber that has been salvaged from old European buildings, this bold design is highlighted by industrial galvanized metal detail. A natural beeswax and mineral oil finish brings rich appeal the unique wood grain, while the ample shelf allows you to prop up cookbooks, iPads, or Grandma’s handwritten recipe. Made in Hungary. How can we have a trending holiday gift giving list without tacos? This has 15 tins which contain all the spices, herbs, and blends you need to make five knockout variations on the theme of tacos, including slammin’ Austin jackfruit tacos, Spanish smoked paprika cauliflower tacos, or Indian eggplant tacos with fennel slaw (recipes included). An inspired gift for taco lovers, foodies, and entertainers who like experimenting in the kitchen. How adorable are these spoons from blessingsfalls on etsy! Choose from 5 designs and they are the perfect unique stocking stuffer! We all have those people in our lives that are impossible to shop for. Those last on the list + quite frankly we dread even thinking of what to get them. Well we came up with a few GREAT options + the good news is these companies all give back in great ways! So tell your picky friend their gifts this year lent a helping hand to incredible organizations! With the ever so popular iPhone losing its headphone jack, a wireless alternative is always a popular gift. And the Bluetooth options from LSTN are gorgeous. We are in love with the beautiful zebra wood featured in their headphones ($179). How about this : For every item sold, LSTN helps give hearing aids to those in need through the Starkey Hearing Foundation. Now we can hear you sighing with this shameless plug but deep down we believe that this planner enhances a gal’s well being and gives the gift of peace. 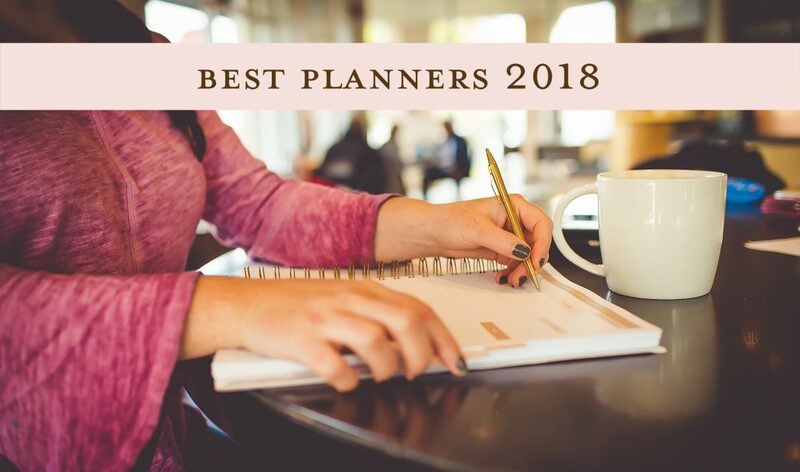 Even psychology today speaks about how a day planner is good for one’s overall health. The planner is like no other! Keeps track of doctor appointments, budgeting, weekly + monthly appointments, passwords, with many spaces to jot notes or recipes! The pickiest friend will love you to pieces when you wrap this up and place it under their tree! Even better news is a portion of the proceeds goes to an organization that empowers women! Drink for a cause? Why of course! Each bottle from OneHope Wine benefits a different cause. Varieties of reds, whites and roses range in price from less than $20 to $80. We love the sparkling wine glitter bottles. At $59-69 each, it’s a great splurge to ring in the new year. The gold and silver bottles benefit child hunger, the pink glitter benefits breast cancer research, the red bottle benefits heart disease research, and the rainbow glitter funds The Trevor Project, a suicide prevention hotline for LGBT youth. So how about that for a drink to donate! The trendy accessories at Live FashionABLE range from gorgeous leather totes ($178) to dainty stacking rings starting at $15. Every item is hand-crafted by women and creates jobs for women overcoming addiction and homelessness. We at Ladypreneur love anything that empowers women! Shopping for that coffee connoisseur can be totally challenging, especially when it seems like they already have all of the brewing equipment they could ever need… and then some….but these few gifts will be jaw dropping, we promise! Brooklyn-based, small-batch coffee roaster with an eye for both quality and equality. They’re invested in connecting the coffee drinkers to the coffee farms that grow the beans and even have a “Farmer Feedback” program that allows you to send feedback right to the farmers themselves. Their personalized subscription is a great option, especially for any coffee drinker with taste preferences that are hard to pin down. The problem with a lot of French presses is that they’re glass and don’t retain heat for long periods of time. This double-walled, stainless-steel carafe keeps coffee hot and fresh for hours. It’s also got two patented stainless-steel microfilters, which are up to 12 times finer than standard ones, to ensure no grinds make it through. Get this for frequent entertainers or your husband who laments about the sad coffee scene at his office. Now he or she can have that perfect cup of coffee no matter where they are! With this hand held pressure caffe espresso machine, coffee maker and manual coffee grind for the perfect morning (or anytime ) ground coffee. Check it out here on Amazon! As the saying goes – the way to a person’s heart is always through their stomach. But here we are speaking directly about our foodie friends. Whether you’re trying to impress someone with an especially refined palate or not, anyone who loves to eat (and who doesn’t?) will appreciate these thoughtful gift ideas. Even those vegans on our list! custom-blended Guittard chocolate and triple-distilled oil of peppermint. This “bark” is finished with a snowfall of handmade peppermint candy pieces. The result is an unforgettable holiday confection with a perfect harmony of flavors and textures in every bite. We never met anyone that could have just one! They have deals this time of year on all their peppermint bark collection such as sticky paws, brittle, and toffee. You don’t have to be Vegan to devour this flavor-packed vegan meal sampler. Each vegan main and side are free of dairy and animal protein while full of taste bud tantalizing flavor. Chef-created recipes made in small batches with the freshest ingredients. Bon Appetit! This is a trifecta of spice, the triple threat of hot. With this one small bundle, you can heat up your meals from breakfast through dinner, and even dessert! Yes we know it is sometimes so difficult to find something super original to give to the men in your life. But we promise these gift ideas will set you apart and make this holiday one to remember for him and for you! We loved man crates.com so much we added a crate that is a bit different! This gift will bring him back to the old days. Flapjacks stacked high as skyscrapers, children frolicking in sprinklers of sweet maple syrup, and an unsubsiding sizzle of bacon and eggs from diners on every corner. In the box is: protein power cake, mix batter dispenser, marion berry syrup, cast iron bacon press, metal egg ring, custom bacon flipper. The reviews are in men love this gift! For the guy in your life that travels! This incredible creation slips over the handle of your carry on and wraps around airplane tray tables to store all your flight needs such as passport, charger, tablet, and magazines, right at your fingertips. Makes traveling a tad easier! Men and their grills! What a find! The Great Scrape is an all-natural BBQ cleaning tool with custom grooves that wear over time for a perfect fit with any grill. Coated with an all-natural, non-toxic, food safe mineral oil and food safe -no metal. Listen 60% of respondents in a gift card survey said that they hoped to receive one as a gift. Rather than fretting over the perfect gift, decide on a gift card this holiday season. They are in! Especially when you know his/her favorite store but not quite sure what exactly they want or need. We know they will appreciate the flexibility more than another unwanted pajama set. These days there are so many available , there is an option for even the hardest to please. Between restaurants, shops, small businesses, local food stores, even gas stations. They really are the practical gift! Sheesh you can even buy travel and they choose the destination with travel gift cards. No more worries these can be some of the most thoughtful gifts! You can now donate everything in your home, from books and electronics to clothes and sporting equipment. Check it out and start decluttering now! Causebox, a subscription-based, quarterly gift box, features handmade, upcycled and socially-conscious products. The items inside each box inspire DIYs, crafts and cooking in your home while also empowering artisans around the world with meals, clean water and education. Subscriptions start at $50 per quarter. In a world of eating out more and more this is the easiest way to do good over the holiday season! How about randomly increase your tips to 50 or 100 percent when you go out to eat. You can even write a nice note on the check to give any hard working server a bigger smile! If you’re an animal lover (or your kids are), you and the family can over to volunteer at your local shelter. What a great way for the kids to learn about gratitude and donating their time to the less fortunate. Often the dogs need to be walked and socialized, which is a great activity for the family. Also you can ask what they are needing and not only support them with items like blankets, paper towels, and pet food, you can also help spread the word to others. Ever hear of it? Neither had we! When you sign up for Amazon Smile you can then choose a charity and every single time you shop a portion will go towards that very charity! But note: you have to make sure that you always use the smile.amazon.com URL instead of amazon.com. How about that for easy giving all year! REMEMBER to download your holiday shopping list here to help stay balanced + organized while doing that holiday shopping!